The Scroll Round Cubic Zirconia Pave Solitaire Engagement Ring features a 2 carat 8mm round center stone set in a six prong die struck head. The design elements of this gorgeous engagement style solitaire ring resembles architectural scrolls. The beautiful pave encrusted curved sides add a lovely touch to its design and can also resemble a flower leaves that is already in bloom. 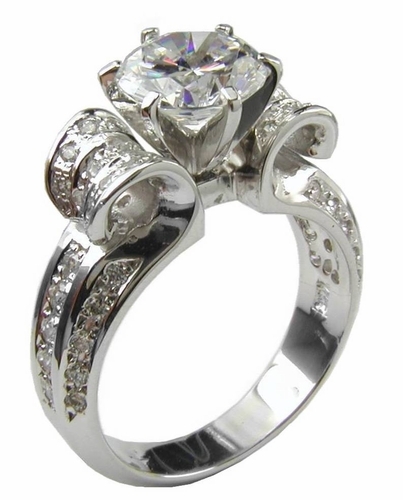 The Scroll solitaire engagement ring is accented by small pave set rounds up and down both sides of the engagement ring. 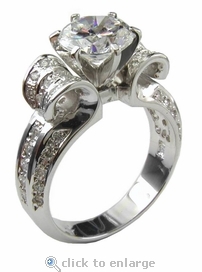 The total carat weight is 2.5 carats of the finest lab created diamond quality Russian formula cubic zirconia stones. Shown in 14k white gold but this ring can also be custom made in 14k yellow gold, 18k gold or Platinum via special order. 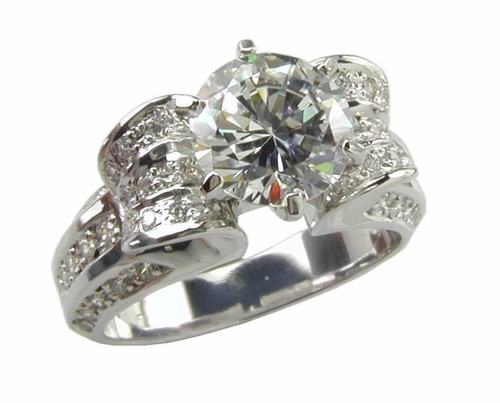 Feel free to call us at 1-866-942-6663 or live chat with one of our cubic zirconia jewelry experts.